I did, however, follow that up with a pencil portrait, which I was also unhappy with, and then another pencil portrait which I actually WAS happy with! I’ll post a photo here, but I’ll try to get a HQ scan for the portrait archives soon. 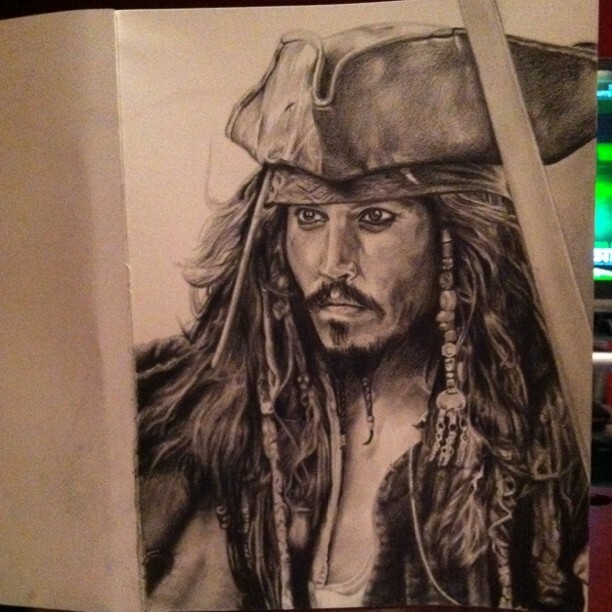 Using a plate from the party goods my parents got Amy for her birthday this year, I drew Johnny Depp as Captain Jack Sparrow. I worked on it on and off for about a month with a couple hours here and there (not every day though). It was fun and a neat project to work on. I have no other portraits planned at the moment, so I’ve returned to drawing cartoons. I recently exercised my nerdy-ness some more and picked up some new comic books that should make good sketch sources to stretch my abilities some. I’d love to get better at drawing people (in a comic-book-style).